Aim: The objective of this study was to identify the expression of eosinophils in sinonasal tissue of chronic rhinosinusitis patients with nasal polyps. Methods: This was a descriptive observasional study which involved chronic rhinosinusitis patients in Otolaringology Clinic of Dr. Sardjito Hospital during year 2013. The eligible criteria were men or women any age, have no sinonasal or leucocytes malignancy. Eosinophils count was obtained from patient's nasal polyp’s tissue under light microscope with 400 X magnification on 5 high power fields consecutively. Information about chronic rhinosinusitis was obtained from medical record. The data obtained was descriptively analyzed. Result and conclusion: There were 90, 47% of chronic rhinosinusitis with nasal polyps tissue has eosinophil count less than 5 cells per high power field. Chronic rhinosinusitis represents an inflammatory condition of the nose and paranasal sinus(es), characterized by two or more symptoms, which one should be obstruction or nasal congestion or nasal secretion (anterior or posterior rhinorrhea), with or without facial pain or facial pressure feeling, with or without reduction or loss of smell, symptoms lasting more than 12 weeks and confirmed by endoscopy and/or radiographic imaging . In Dr. Sardjito Hospital during the years 2000-2006 the frequency of chronic rhinosinusitis about 2.5-4.6% of all clinic visit . In 2006-2007 the chronic rhinosinusitis patient get 118 (42%) of the all rhinology patients . Chronic rhinosinusitis can be divided into two subtypes, chronic rhinosinusitis with nasal polyps and without nasal polyps. Both groups of rhinosinusitis are different in terms of inflammatory profile and remodeling processes, which may affect to the prognosis, asthma comorbidity, surgical procedures, recurrence rate, and pharmacological management . The pattern of inflammatory cells which involved in the processes and the inflammatory cells response are different between chronic rhinosinusitis with nasal polyps and without nasal polyps can clarify the pharmacological management needs. Implications for histopatologic profile are including the macrolide therapy selection for neutrophilic chronic rhinosinusitis to provide Interleukin 8 (IL8)-modifying antineutrophilic activities. Local corticosteroid therapy and the use of aggressive or oral corticosteroids for the significant eosinophils findings . The right pharmacological therapy as effective as the surgical therapy, by knowing the presentation of inflammatory cell involved can help in the selection of the right pharmacological therapy . Material used were patient’s sinonasal tissues who have undergone endoscopic surgery. Sinonasal tissue samples were stained using Hematoksilin-Eosin and fixed using formaldehyde 10%. This was a descriptive observasional study which involved chronic rhinosinusitis patients in Otolaringology Clinic of Dr. Sardjito Hospital. The sampling method is using a total sampling. The samples were limited registered during the year 2013. Inclusion criteria’s in this research were patients of chronic rhinosinusitis, men or women at any age, chronic rhinosinusitis patients who undergone endoscopic procedures and signed informed consent. Patients with sinonasal malignancy and leukocytes malignancy were excluded. The material were patient’s sinonasal tissue, observed under the light microscope and calculated at five high power field (HPF) 400 X magnification consecutively. Data’s about the polyp or nonpolyp were obtained from endoscopic finding that are recorded on the patient's medical record. The datas that have been obtained from the data collection process are presented in the tables and then processed using the SPSS program 10 for Windows® Operating Systems. Analysis of univariate data was performed to find out the frequency distribution of the variable. 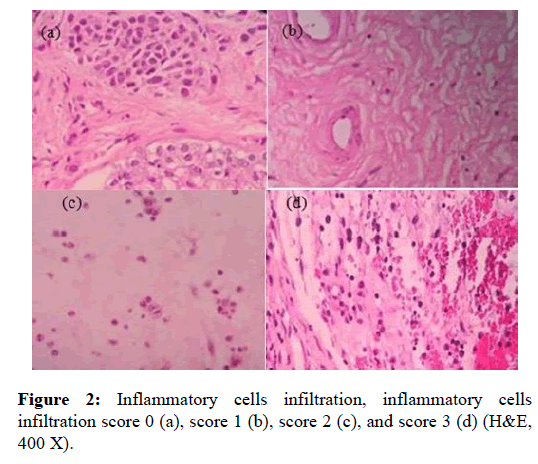 Researchers in this study calculated eosinophil and observed histopathology consisting of epithelium integrity, the presence of tissue edema, degree of inflammation, using subjective scale 0 indicated non-intact epithelium and 1 indicated intact epithelium (figure 1), subjective scale 0-3 for degree of inflammation in which 0 indicated the absence of inflammation cell, and 3 indicated a big quantity of inflammation cell infiltration (figure 2) . 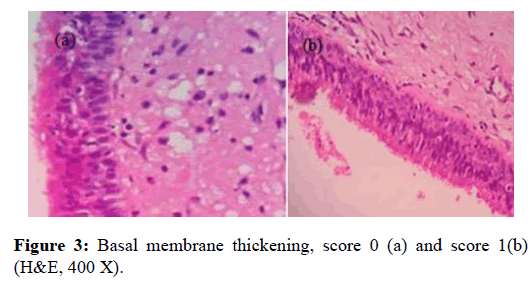 Additionally, the researchers also observed histological feature as indicated by basal membrane thickening and the evaluation used subjective scale of 0 indicated unobservable basal membrane, 1 indicated observable basal membrane thickening (figure 3) . The histological observation and analysis in the study were conducted to enrich information of chronic rhino sinusitis histopathology (figure 4). 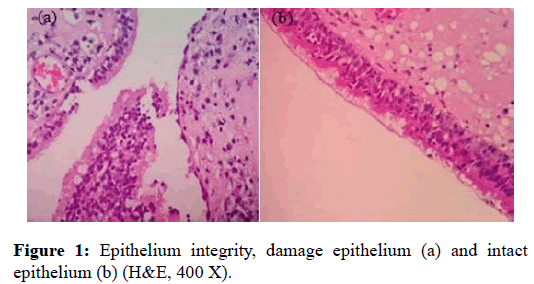 Figure 1: Epithelium integrity, damage epithelium (a) and intact epithelium (b) (H&E, 400 X). Figure 2: Inflammatory cells infiltration, inflammatory cells infiltration score 0 (a), score 1 (b), score 2 (c), and score 3 (d) (H&E, 400 X). Figure 3: Basal membrane thickening, score 0 (a) and score 1(b) (H&E, 400 X). Figure 4: Eosinophil infiltration on sub-epithelium (H&E, 400 X). 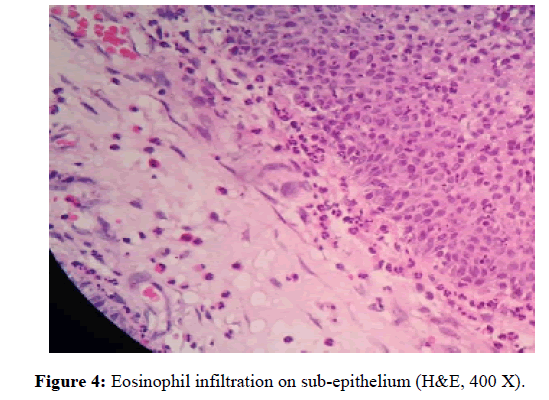 The results of the observation of 21 sinonasal tissue preparations were classified into two, which were the results of the calculation of the eosinophil and the results of the observation of the sinonasal histopathology in general. There were 10 tissue preparations indicating eosinophil infiltration, while the remaining 11 preparations showed no indication of eosonophil infiltration. Table 1: Eosinophil count in Chronic Rhinosinusitis. Once the analysis has been completed, the mean of the eosinophil number was 2.1 or rounded to 2 cells per HPF. The maximum number of the eosinophil per HPF was 23 cells, while there were some preparations that did not contain any eosinophil. There were 10 preparations of sinonasal tissue of the patients with chronic rhinosinusitis along with polyp and eosinophil infiltration, while there was not any eosinophil infiltration found in the other 10 preparations. Histopathological analysis was made by scoring the existing observed parameters. From the 21 preparations there were 3 preparations with intact epithelium, while the other 18 preparations had non-intact epithelium which indicate of erosion and some detached epithel cells. Almost all of the nonintact epithelium preparations had basal membrane thickening. There were 17 preparations found with basal membrane thickening. The results of the observation of stroma showed that there were 8 preparations indicating the edematous stroma, 11 preparations indicating the fibrosis and 2 preparations indicating the histopathological feature of sinonasal polyp. The results of the inflammation degree showed that there were 2 preparations with inflammation cell infiltration, while there were 19 preparations indicating inflammation cell infiltration with the score 1-3, it summarized on (figure 5). Figure 5: Frequency of histopathologic parameters on chronic rhinosinusitis. The observation and the histological analysis in the study were conducted on the basis of the results of the endoscopy surgery and there was not any data conducted from the use of prior drugs. The surgery procedure was carried out if pharmacological management did not give good result. There were 10 preparations of the 21 preparations observed and were indicating eosinophil infiltration. However, there were only 2 preparations indicating tissue eosinophil of more than 5 cells per HPF. It was considered as eosinophilic if the tissue eosinophil contained more than 5 cells per HPF.7 The studies by Couto et. al. suggested that they did not get any chronic rhinosinutis feature with eosinophilic polyp. It might be because the patients were using both local and systemic corticosteroid during biopsy. The use of topical corticosteroid caused the decrease in the number of tissue inflammation cells. Davidsson and Hellquist , analyzed 95 patients and classified nasal polyp histology into four: 1) eosinophilic type (86.3%), 2) fibroinflammatory polyp (7.3%), 3) hyperplasia seromucin glands (5.3%), and 4) stromal atypia polyp 1.1%). The study was not consistent with the aforementioned studies and it might be because the sinonasal polyp histopathology type in Asia and Indonesia was dominated by neutrophilic type and it difference from that found in Europe that was dominated by eosinophilic type [11,12]. Based on the results of the histopathological analysis it was found that there were 18 sinonasal tissue preparations indicate the non-intact epithelium with chronic rhinosinusitis with polyp. It was consistent with the hypothesis put forward by Kirtstreeskul , that the rupture of epithelial mucosa was caused by allergy or infection and it caused lamina propria prolaps of the mucosa that subsequently triggered the formation of polyp. Additionally, the erosion and the damage of the epithelial membrane could explain the exacerbation of acute bacteria of the patients with chronic rhinosinusitis. The damaged epithelium could give colony bacteria site to invade sinonasal tissue and caused infection.10 Additionally, the damaged epithelium might also be caused by specimen sampling procedure that pathologists were required to make sure that the damage was caused by inflammation or artifact during specimen sampling. The results of the study by Ponikou et. al. with 22 samples showed that basal membrane thickening took place to all of the patients with chronic rhinosinusitis. There were 17 of 21 sinonasal tissue preparations indicate the basal membrane thickening. The basal membrane consisted of basal lamina and reticular lamina that contained reticular fiber. The basal membrane thickening was essentially the thickening of the reticular lamina. As in as asthma, there was deposition of types I, III, and IV collagen taking place in chronic rhinosinusitis and there was extracellular matrix such as fibronectin, laminin, and other non-collagenous substances under epithelium that degraded as a result of chronic inflammation. The collagen deposition might be caused by synthesis and degradation imbalance. The process was regulated by matrix metalloproteinase-9 (MMP-9) and its inhibitor, and tissue inhibitor of matrix metalloproteinase-1 (TIMP-1). Overexpression of the TIMP-1 would result in the deposition of the extracellular matrix and basal membrane thickening by inhibiting the degradation of the extracellular matrix . Based on the results of the study by Kakoi and Hiraide in Cauto et. al. polyp was classified into edematous polyp (60%), cystic and glandular polyp (27%), and fibrous polyp (13%). The results of the study were not consistent with the aforementioned study, where it was found that there were 8 preparations (40%) representing edematous polyp, 11 preparations (55%) representing fibrous polyp (i.e., fibroinflammatory polyp), and a preparation diagnosed to be polyp that clinically did not show any polyp histology. More than a pattern of histological features found in a single sinonasal polyp such as edematous and also fibrosis so that it was necessary to observe the most dominant pattern in establishing whether the polyp was of edematous type or fibroinflammatory type. The appearance of the stromatous edema histopathology was spaced stroma resulting from the presence of edema. The edema in chronic rhinosinusitis was caused by the pathomechanism of the disease involving mediators that resulted in the increase in vascular permeability so that there was a big quantity of liquid came into the stroma area and finally caused edema. Additionally, the edema taking place in the chronic rhinosinusitis was caused by the presence of disorder in T-reg resulting in transforming growth factor (TGF-1) expression. The decrease in the TGF-1 caused the decrease in tissue inhibitor of matrix of metalloproteinase (TIMP-1) and the increase in matrix of metalloproteinase (MMP-9) that could cause destruction of extracellular matrix and also edema. In short, it might mean that the decrease in the TGF-1 was interpreted as the decrese in the ability to improve tissues as reflected in the distantly spaced binding tissues, edematous appearance and inflammation cell infiltration . Fifty five percent of the preparation in the study showed that fibrosis was more dominant than edema. The results of the study showed that there were 19 tissue preparations with inflammation at different levels and various infiltrations of inflammation cells, including eosinophil, neutrophil, and lymphocyte infiltrations, but the study calculated the eosinophil only. There were 3 preparations indicating severe inflammation with massive inflammation cells, infiltration. There were 2 preparations that did not indicate any inflammation feature. It might be because the patients regularly consumed drugs that could decrease the number of the inflammation cells and other inflammation features before endoscopy. Based on the results of the study of the tissue preparations of the patients with chronic rhinosinusitis in the Otolaringology Clinic of Dr. Sardjito Hospital, it could be concluded that: 1) There was 90.47% sinonasal tissue indicated the number of eosinophil tissue of less than 5 cells per HPF. 2) The chronic rhinosinusitis tissue with nasal polyps did not have any eosinophilic feature. 3) The mean of the tissue eosinophil was 2 cells per HPF, while the biggest eosinophil tissue had 23 cells per HPF. We would like to thank the director Dr. Sardjito hospital who has given permission to conduct this study. Acknowledgements also go to Dr. Dewiyani Indah Widasari, SpPA., PhD who have given valuable input in this study. The author also expressed gratitude to the patients who have been willing to participate as research subjects and to all those who have given support to this study. Piromchai P, Kasemsiri P, Laohasiriwong S, et al. Chronic rhinosinusitis and emerging treatment options. Int J Gen Med. 2013; 6: 453-64. Harowi MR, Soekardono S, Djoko R BU, et al. Kualitas hidup penderita rinosinusitis kronis pasca-bedah. CDK 187. 2011; 38: 429-34. Multazar A. Thesis: Karakteristik Penderita rinosinusitis kronis di RSUP H. Adam Malik Medan tahun 2008. Medan: Universitas Sumatera Utara, 2011. Van Crombruggen K, Zhang N, Gevaert P, et al. Pathogenesis of chronic rhinosinusitis: Inflammation. J Allergy Clin Immunol. 2011; 128: 728-32. Snidvongs K, Lam M, Sacks R, et al. Structured histopathology profiling of chronic rhinosinusitis in routine practice. Int Forum Allergy Rhinol. 2012; 2: 376-85. Fokkens W, Lund V, Mullol J. European position paper on rhinosinusitis and nasal polyps 2007. Rhinol Suppl. 2007: 1-136. Lacroix JS, Zheng CG, Goytom SH, et al. Histological comparison of nasal polyposis in black African, Chinese and Caucasian patients. Rhinology 2002; 40: 118-21. Ponikau J, Sherris D, Kephart G, et al. Features of airway remodeling and eosinophilic inflammation in chronic rhinosinusitis. J Allergy Clin Immunol. 2003; 112: 877-82. Couto LGF, Fernades AM, Brandão DF, et al. Histological aspects of rhinosinusal polyps. Braz J Otorhinolaryngol. 2008; 74: 207-12. Davidsson A, Hellquist HB. The so-called 'allergic' nasal polyp ORL J Otorhinolaryngol Relat Spec.1993; 55: 30-35. Adhikari T, Prepageran N. Asian Nasal Polyps: A Separate Entity?. Med J Malaysia. 2013; 68: 445-47. Önerci MFerguson B. Nasal polyposis. Berlin: Springer, 2010. Kirtsreesakul V. Update on nasal polyps: Etiopathogenesis, J Med Assoc Thai 2005; 88: 1966-72. Bassiouni A, Naidoo Y, Wormald P. Does mucosal remodeling in chronic rhinosinusitis result in irreversible mucosal disease?. Laryngoscope. 2012; 122: 225-29. Huvenne W, Van Bruaene N, Zhang N, et al. Chronic rhinosinusitis with and without nasal polyps: What is the difference? Curr Allergy Asthma Rep. 2009; 9: 213-20.